Two weeks til Christmas!? Time to recommend a holiday album for all the Celtoids out there–and a bonus spring-themed record as well, from the same artists. 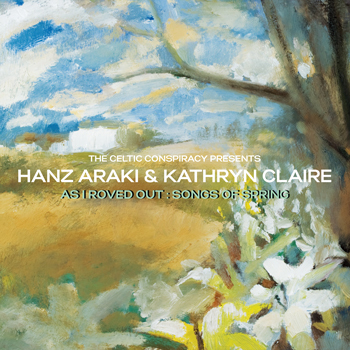 I’m talking about Hanz Araki and Kathryn Claire, who recently sent me two CDs that are certain to put you in the holiday spirit, with none of the “been there done that” feel of most Christmas music. 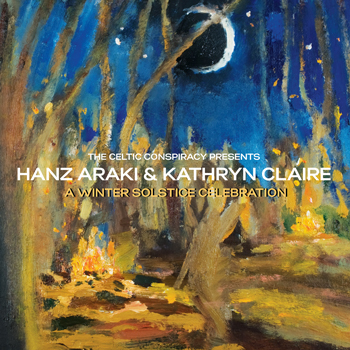 Presenting A Winter Solstice Celebration, and As I Roved Out: Songs of Spring, both from Hanz Araki (flute, whistles, vocals) and Kathryn Claire (violin, guitar, vocals), with various guests. Note the crisp ethnic percussion by Joe Trump, a regular at Portland area Irish sessions. The music here harkens back to a time when the function of Celtic music was more than just a backdrop for the sale of Guiness and Jameson. The music used to remind people that the dark, cold days of winter would not last forever, and it filled them with warmth and hope. The songs and tunes here lean to the Renaissance and Medieval side of things, with a mellow classical beauty that fits the season just right. The same lovely feel permeates the spring-themed album. Here is one sample from each, and a sweet video clip with an older setting of Auld Lang Syne . Enjoy! Hanz and Claire are in the midst of their annual Winter Solstice Tour, check here for DETAILS. Seven joys cut short, but Searching for Lambs more than made up for it…wow! The Fiddlefreak blog continues to open my ears to new great music! PS cool directional snow on the site!